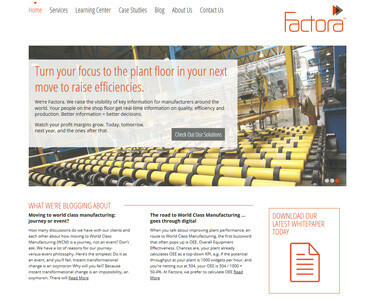 Imaginis Business Development put together a team that included Laura K and Flexer to help Factora Solutions to implement a broad marketing strategy that included customer engagement through white papers, case studies, blog posts and a new engaging website design. Factora Solutions plan, design and implement Manufacturing Execution Systems (MES) and Manufacturing Operations Management (MOM), with the Proficy software suite of GE Intelligent Platforms. The most exciting part of the project for me was to help Imaginis BD and Factora integrate the powerful Customer Relations Management tools of Microsoft Dynamics with their website metrics. We accomplished this by using Click Dimensions Marketing Automation for Microsoft Dynamics CRM.